It's almost time for the talent show at school, and Erin couldn't be more excited. It's her time to take center stage! Plus, she and her friends from coding club are putting together an awesome coding program for the show. But Erin has a big secret: she has anxiety. And when things start piling up at home and school, she starts having trouble handling everything. 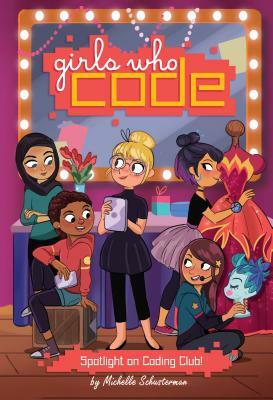 Her friends from coding club have always been there for her, but will they be as understanding when the going gets tough? Sometimes in coding--like in friendship--things don't go exactly as planned, but the outcome can be even better than you'd imagined. Michelle Schusterman is the author of I Heart Band, a Scholastic Reading Club pick, The Kat Sinclair Files, and Olive and the Backstage Ghost. She's also an instructor at Writopia Lab, a nonprofit organization that offers creative-writing workshops for children and teens from all backgrounds. Find out more at michelleschusterman.com.